Mannerly Mutts Maine Dog Training in Beautiful York Maine - Dog training classes in Maine to meet your family's' needs. Have you always wanted a dog that is well trained? With our help, you can achieve that! Either click on the button below to e-mail us or copy this address to your e-mail program mannerlymutts.rubin@gmail.com. Call and tell us about your dog! Dog obedience training will improve your relationship with your dog(s). Do you need a dog training program that can help you to...? Love having a dog but want to love it even more? Want your dog to listen amazingly so you can have the freedom to do things with them? Wish your dog would stop doing things like jumping, pulling on the leash, chewing or barking too much? You’re in the right place! We’ll help you with your dog through our extraordinarily unique, fast dog training classes in Maine. Your dog will listen all the time, even around the biggest distractions and off leash training with many areas to practice dog training in Maine. Our Maine dog trainer, Robin Rubin, brings clients on field trips, when the team is ready, to work publically and in more distractions. Call us now and tell us all about how we can help you with our professional Maine dog training programs. We always work to give dogs the best and most full lives with their owners – and their owners the most enjoyable time during the years they have with their dogs. Sure, dogs and humans don’t speak the same language naturally – but that’s why we’re here! 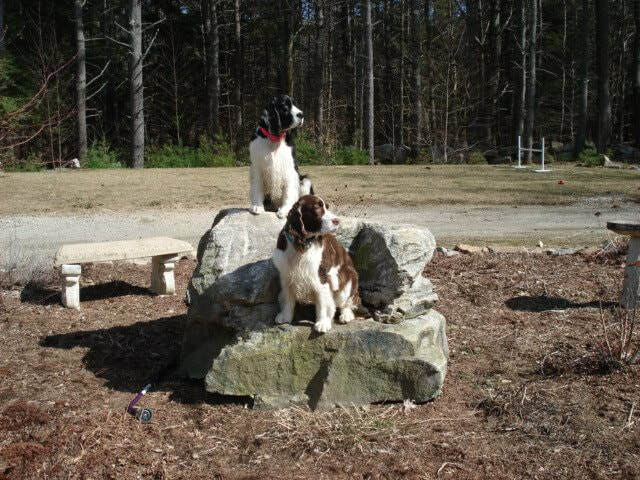 Located in York Maine, Mannerly Mutts Maine dog training has access to many different areas to help prepare you and your dog for real world adventures available in our dog training classes in Maine. "I wanted our dog, Kila, to be able to walk the beach without any negative dog encounters. We thought the chances of success were remote, but wanted to try. Additionally, remote collar training would be a real plus when Kila's hearing and vision worsened. Robin helped to "train" me out of my nervousness when I saw a dog approaching. We worked on training Kila to an e-collar. Robin modified the training to accommodate Kila's arthritis. The results are amazing." "Robin saved me and my Lola, who was aggressive with strangers and other dogs before our training sessions. Because of Robin I can walk my dog and ENJOY our bonding time together and never panic when I see others approaching. I control the situation by using the techniques I learned from Robin. Thank you, Robin, for being on Lola's side, for caring about her, and making her world and mine a happier, safer place!!!! She CAN help you and your dog." You can find more client testimonials on our testimonials page. Information about Robin Rubin, our head Maine dog trainer, can be found on our trainers' page. or e-mail us at mannerlymutts.rubin@gmail.com. Subscribe to our newsletter by submitting your e-mail below. This e-mail will only be used for distributing newsletters.